The Sovereign Prince (Fürst) of Liechtenstein is the monarch and head of state of Liechtenstein. 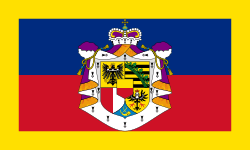 The Princely Family of Liechtenstein, after which the sovereign principality was named in 1719, hails from Castle Liechtenstein in Lower Austria, which the family possessed from at least 1140 to the thirteenth century, and from 1807 onward. It is the only remaining European monarchy that practises strict agnatic primogeniture, meaning only first-born males may inherit the throne. Through the centuries, the dynasty acquired vast swathes of land, predominantly in Moravia, Lower Austria, Silesia, and Styria, though in all cases, these territories were held in fief under other more senior feudal lords, particularly under various lines of the Habsburg family, to whom several Liechtenstein princes served as close advisors. 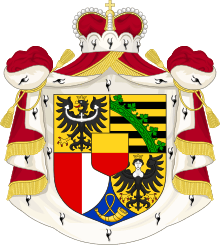 Without any territory held "immediately" (i.e., directly) from the Imperial crown, the Liechtenstein family, although noble, did not qualify for a seat in the Diet of the Holy Roman Empire. By purchase in 1699 and 1712 from the Counts of Waldburg-Zeil-Hohenem of, respectively, the small Herrschaft (lordship) of Schellenberg and the countship of Vaduz, the Liechtensteins acquired immediate lands within the Holy Roman Empire which made them eligible for elevation to the Imperial Diet. Thereby, on 23 January 1719 Emperor Charles VI decreed Vaduz and Schellenberg were henceforth united and raised to the status of a Fürstentum (principality) under the name "Liechtenstein" for "[his] true servant, Anton Florian von Liechtenstein". Although the family continued to own larger territories in various parts of central and eastern Europe, it was in right of Liechtenstein's status as an Imperial estate that the family of wealthy noble Austrian courtiers became a dynasty of Imperial princes, continuing to dwell in the imperial capital of Vienna or on their larger estates elsewhere, not taking up permanent residence in their principality for more than 300 years, moving into their Alpine realm only in 1938, after dissolution of both the Holy Roman Empire and the Austro-Hungarian Empire. The Prince of Liechtenstein has broad powers, which include the appointment of judges, the dismissal of ministers or government, veto power, and the calling of referenda. The Liechtenstein constitutional referendum, 2003 was a proposal put forth by reigning Prince Hans-Adam II to revise parts of the Constitution of Liechtenstein, on the one hand expanding the monarch's power with the authority to veto legislation, while on the other hand securing for the citizenry the option to abolish the monarchy by vote at any time without being subject to princely veto. The right of the parishes that make up the Principality to secede was simultaneously recognised. Prince Hans-Adam had warned that he and his family would remove to Austria if the referendum were rejected. Despite opposition from Mario Frick, a former Liechtenstein prime minister, the Prince's referendum was approved by the electorate in 2003. Opponents accused Hans-Adam of engaging in emotional blackmail to achieve his goal and constitutional experts from the Council of Europe branded the event as a retrograde move. A proposal to revoke the Prince's new veto powers was rejected by 76% of voters in a 2012 referendum. On 15 August 2004 Prince Hans-Adam II formally delegated most of his sovereign authority to his son and heir, the Hereditary Prince Alois, as a way of transitioning to a new generation. Formally, Hans-Adam remains Head of State. Reigning Prince of Liechtenstein, Duke of Troppau and Jägerndorf, Count of Rietberg, Sovereign of the House of Liechtenstein. Current personal standard of the Prince of Liechtenstein, adopted in 1982. Personal standard of the Prince of Liechtenstein from 1957 until 1982. Former Princely Standard as it appeared in 1912. ↑ Liechtenstein prince wins powers BBC News Online, 16 March 2003. Retrieved 29 December 2006. ↑ The Age 18 March 2003. Theage.com.au (18 March 2003). ↑ "Liechtenstein votes to keep prince's veto". Reuters. 1 July 2012. Retrieved 1 July 2012. ↑ Country profile: Liechtenstein – Leaders BBC News, 6 December 2006. Retrieved 29 December 2006. ↑ Liechtenstein House Laws. Fuerstenhaus.li.